The 2017 Chris Sailer Kicking College Camp Was Loaded With Talent! The 2017 Chris Sailer Kicking College Camp took place in Tampa, FL on July 14-16. The athletes arrived from all over America on Friday and checked into the Renaissance Tampa International Plaza near the airport. Saturday began with a 3 hour training session, followed by a 2 hour film breakdown session. Athletes and staff headed to downtown Tampa for an evening of fun and relaxation. Sunday kicked off with another 3 hour training session before the specialists returned to the hotel to pack up and head back to their colleges. The weekend offered a great combination of training and comradery. This camp was absolutely loaded with talent. Specialists from the SEC, BIG 12, PAC 12, ACC & more were in attendance. The competition was intense from start to finish. Take a look at the results. Eddy Pineiro (Florida) – Eddy is an incredible talent that has NFL written all over him. Look for Eddy to follow up a tremendous freshman year with another strong sophomore campaign. 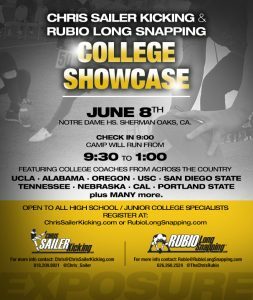 Tristan Vizcaino (Washington) – Tristan may just be the most talented all around specialist in the nation. His ability on field goal, kickoff and punt is off the charts. Garrett Owens (Iowa State) – Garrett is primed for a huge 2017 season. The transfer from Oregon State has great NFL ability and he is nails mentally. Aidan Schneider (Oregon) – Aidan has put together one of the strongest field goals percentages in the history of college football over the past 3 seasons. Expect greatness this season. Blanton Creque (Louisville) – Blanton is as smooth and accurate as they come. He hits a pure ball and has excellent range. Blanton should be in the Lou Groza Award conversation by seasons end. Andrew Gantz (Cincinnati) – Andrew is one of the best kicker in the nation. Very smooth kicker that dominates under pressure. Andrew should challenge the best in 2017. Jack Gonsoulin (LSU) – Jack is a big time talent. He hits an NFL level ball and does well under pressure. Look for Jack to make some noise at LSU this year. Cole Murphy (Syracuse) – Cole continues to make big strides. He has great ability on both field goal and kickoff. Look for Cole to have a big season this Fall. Cole Tracy (Assumption) – Cole has proven himself during the season (7 FG’s in one game… twice) and proved himself once again at this camp against the big name college guys. He is simply a great kicker. Lorran Fonseca (Nichols State) – Lorran can kick with the best of them. He hits a big time ball on both field goal and kickoff. Look for Lorran to dominate this coming season. Liam Jones (Kansas), Andrew Strauch (UCLA), Jaime Medina (Sacramento State), Kevin Robledo (SMU), Jeffrey Chan (Syracuse), Zach Mays (Cornell), Diego Marquez (Miami), Cole Smith (Cincinnati), Jake Lane (Jacksonville State), Jose Perez (Incarnate Word), Parker Grothaus (Incarnate Word), Jefferson Norwood (Lenoir Rhyne). Michael Carrizosa (San Jose State) – Michael is the real deal. The former Ray Guy Award Finalist has the NFL in his sights. He absolutely hammers the ball and punts with great consistency. Shane Tripucka (Texas A&M) – Shane is a fantastic SEC punter. He had a great 2016 and shows all the signs of building on that in 2017. He has NFL ability. Jacob De Maio (Weber State) – Jacob is a great punting talent. He is big, tall and very strong. He was excellent in 2016 and should be even better in 2017. DJ Arnson (Northern Arizona), Taylor Cornish (Missouri Southern State). Left: Andrew Gantz offers private lessons in the Cincinnati area. As you all start your football season and gear up for several upcoming Chris Sailer Kicking FALL camps, now is the time to utilize the instructors in your area. Chris Sailer Kicking has staff members all over the country running lessons. The objective is to get Kickers & Punters ready for upcoming camps. They teach the Chris Sailer way by getting athletes ready mentally as well as physically while still having fun. To find out more about upcoming CSK events and register online click HERE. *All instructors have been personally endorsed by Chris Sailer and are Senior Instructors or Staff Members. Sunday in the Chesapeake, VA area at 11 am. Left to right: Carson Wiggs holds private and group session regularly in Texas. 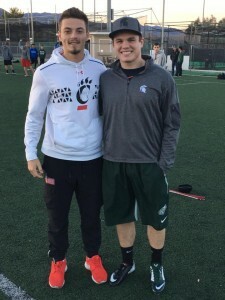 He is pictured here with Chris Sailer. 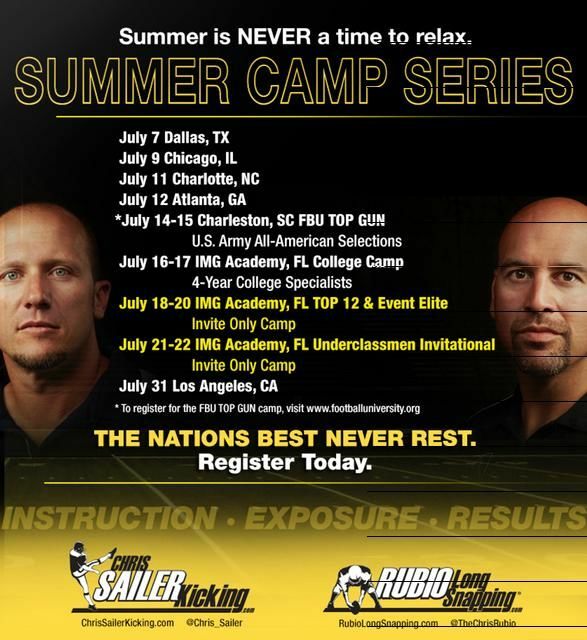 With several upcoming Chris Sailer Kicking Summer camps, and FBU TOP GUN right around the corner, now is the time to utilize the instructors in your area. To find out more about upcoming events and register online click HERE. 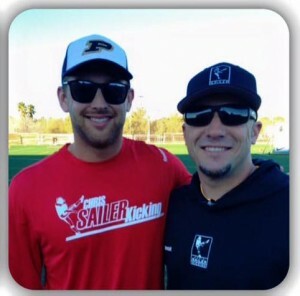 As you know, Chris Sailer Kicking has staff members all over the country running lessons. The objective is to get Kickers & Punters ready for upcoming camps. They teach the Chris Sailer way by getting athletes ready mentally as well as physically while still having fun. Summer is no time to relax! To be the best, you have to train with the best. Take advantage of the long Holiday weekend! 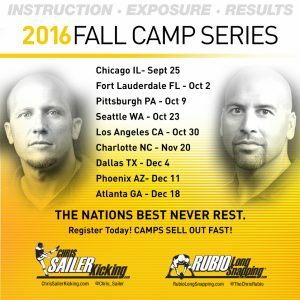 As you know, Chris Sailer Kicking has staff members all over the country running lessons. 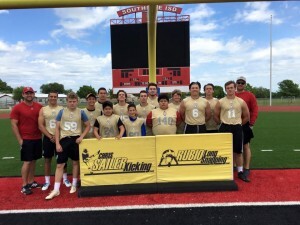 The objective is to get Kickers & Punters ready for upcoming Chris Sailer Kicking camps. 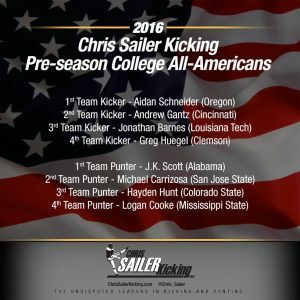 They teach the Sailer way by getting Kickers & Punters ready mentally as well as physically while still having fun. With several upcoming SUMMER camps, COLLEGE camps and FBU camps now is the time to utilize the instructors in your area. To find out more about upcoming events click HERE. Here is what you can expect to see every WEDNESDAY! *All the gentlemen listed are official Chris Sailer Kicking Senior Instructors or Staff Members. SUMMER is no time to relax! 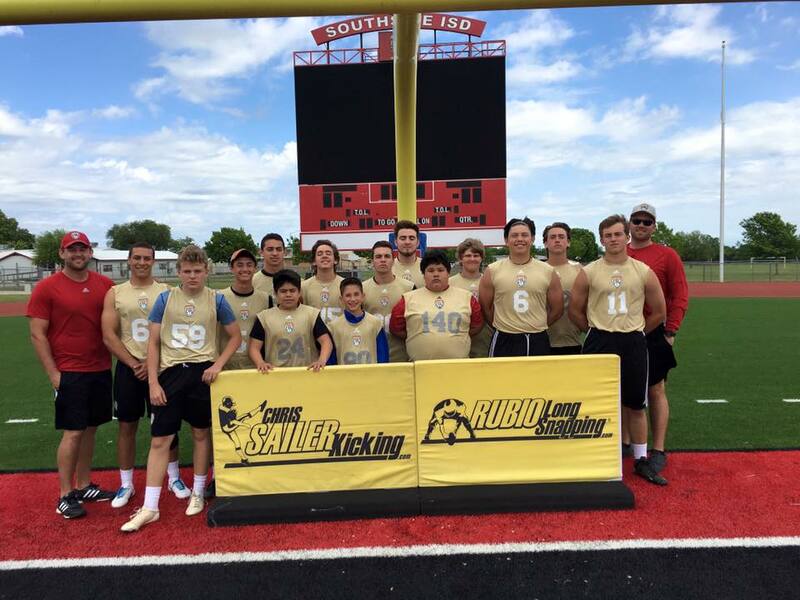 Far left: Carson Wiggs, Senior Chris Sailer Staff Member, leads an FBU camp in TX. 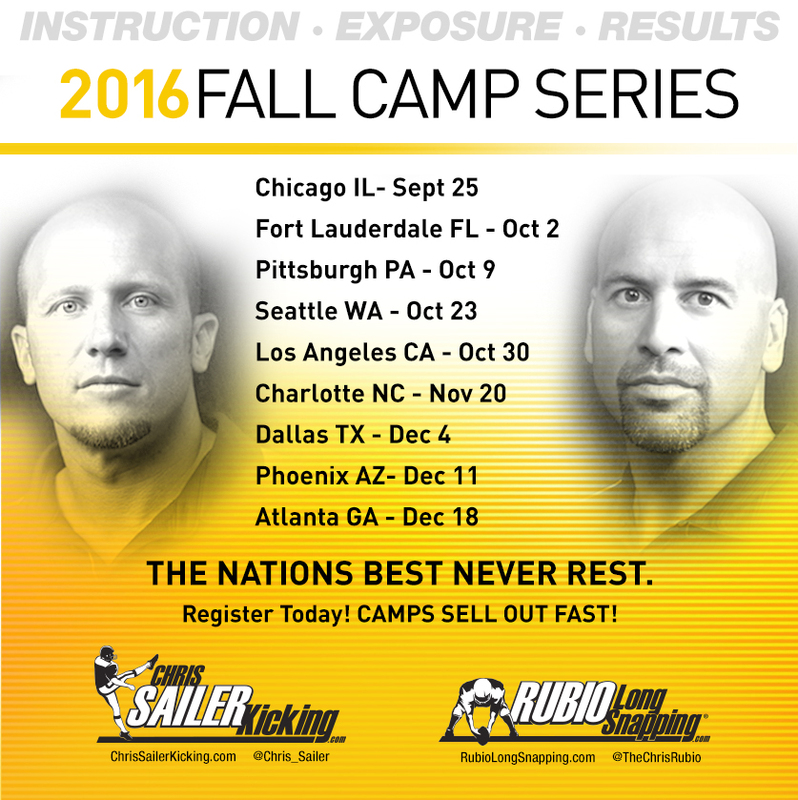 As you know, Chris Sailer Kicking has staff members all over the country running lessons. 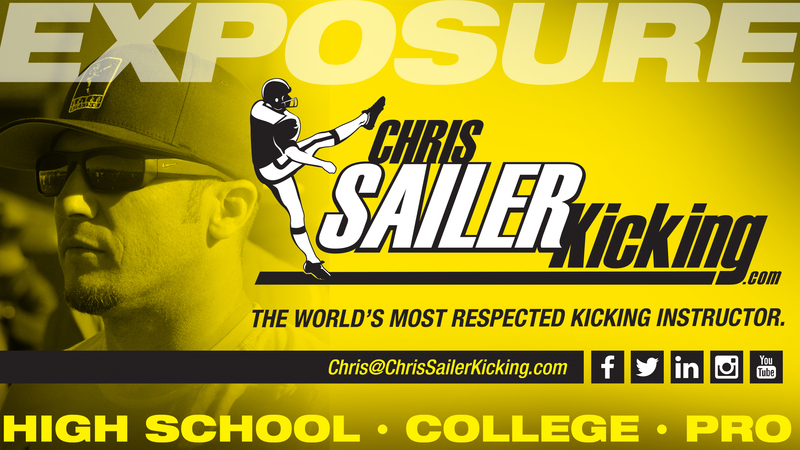 The objective is to get Kickers & Punters ready for upcoming Chris Sailer Kicking camps. 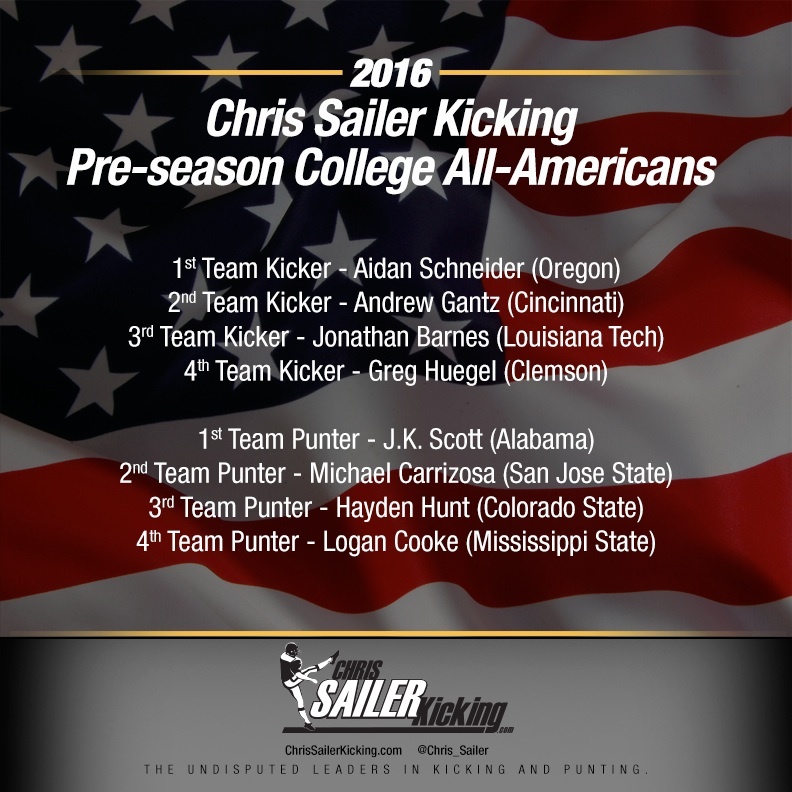 They teach the Sailer way by getting Kickers & Punters ready mentally as well as physically while still having fun. SUMMER is no time to relax! 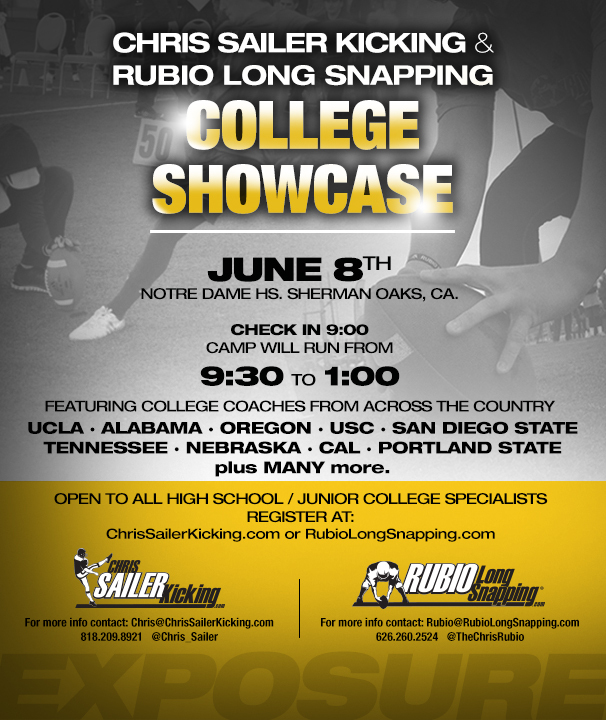 With several upcoming SUMMER camps, COLLEGE camps, FBU camps, including our COLLEGE SHOWCASE now is the time to utilize the instructors in your area. To find out more about upcoming events click HERE. With several upcoming SUMMER camps including our COLLEGE SHOWCASE now is the time to utilize the instructors in your area. To find out more about upcoming events click HERE.